In this review we feature the best gaming chairs with speakers that provide very good sound performance for gaming and are very comfortable to use. These gaming chairs are built with very comfortable materials which reduces fatigue after prolonged hours of gaming. Furthermore, they come with integrated speakers that provide a total sound immersion gaming experience and works with multiple music sources including PC and RCA stereo inputs. These gaming chairs have an ergonomic design with gunstock arms and pedestal with tilt and swivel capabilities for you to adjust to any position. They are great for playing video games, listening to music, watching TV or just for relaxation. If you are looking for gaming chairs with speakers with advanced surround sound technology, be sure to check out our top picks below! 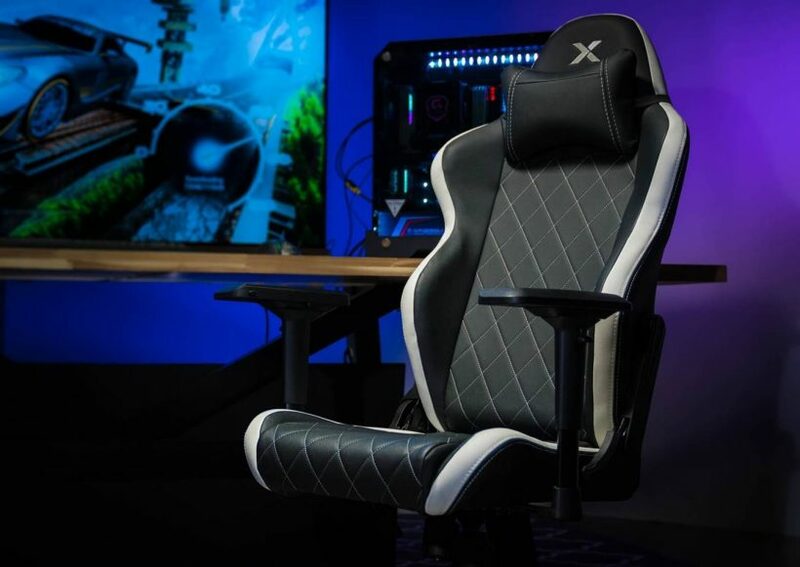 The X Rocker 51396 Pro is a gaming chair with speakers designed for professional gamers with a lot of convenient and immersive audio features. It comes with a built-in 2.1 sound system, with 2 tweeters installed discreetly in the headrest of that chair and a subwoofer. Their placements and the use of Ace Bayou’s Audio Force Modulation Technology provides a fully immersive experience for games, movies, music and more. The AFM technology helps you not only listen to the music and sound, but actually feel it. The chair is placed on a pedestal that enables tilting and swivelling which allows the user to sit comfortably for long periods of times without any strains. It also features gun-stock arms for added upper-body comfort. The gaming chair can be connected with multiple other chairs so the experience can be shared between multiple people while playing multiplayer games. The X Rocker chair also has a built-in radio wireless receiver for a hassle-free experience. Overall, the X Rocker 51396 is one of the best gaming chair with speakers that feels extremely comfortable to use and we highly recommend them. The X Rocker Pro Series II performs very well in creating an immersive experience with its well-implemented 2.1 sound system. The tweeters, even though projecting sound away from the ear, can be heard clearly and sharply. This design also reduces fatigue as the eardrum is not constantly under sound pressure, enabling longer playing and listening sessions. The subwoofer, placed in the outer part of the back seat, provides a low rumble that simulates the experience of going to a cinema. Almost all sounds can be felt and this creates a true feeling of ‘being there’. It is necessary to note that the tweeters are placed at the top of the chair while the subwoofer is placed lower in the chair, recreating a natural vertical sound image created by the perception of audio frequencies. The output of the speakers is very high, having the ability to turn up the music or sound during quiet periods. The built-in radio wireless receiver ensures that the audio quality is high and that there are no transmission losses. The option of connecting with RNC cables enables the chair to be connected to any type of platform, old or new, while keeping high fidelity audio. The gaming chair provides an all-round good experience, both from an audio and comfort experience. It has a high quality build, being sturdy and long-lasting. It is able to fit and give support to any kind of body type in a comfortable manner. The pedestal which the chair sits is able to tilt and swivel, removing any pressure on the spine and enabling the chair to be used for long periods of time. The chair has a built-in radio wireless receiver, which means that it is not bound by cables, creating additional convenience and safety. It can be placed anywhere, at any angle, without creating any issues by tethering cords. The gunstock armrests offer additional comfort and support for the arms and shoulders. The chair can be connected to multiple gaming chairs, enabling multiple gamers to share and improve their experience. The audio system design works great for creating an immersive experience for games, movies and music. The panel on the lower right side of chair provides control over the volume, treble and bass volumes. The Verdict? The X Rocker 51396 Pro is one of the best gaming chair with speakers that provide a very good experience for watching films and listening to music, as well as simply relaxing. The solid and comfortable design can enable users to use the chair for extended periods of time. The gunstock armrests and the swivelling pedestal reduce spine pressure and add to comfort. The X Rocker’s built in 2.1 audio sound system creates a convincing immersive experience through the placements of its speakers and the implementation of the Audio Force Modulation technology. The tweeters are placed discreetly in the headrest, close to the ears, while pointing outward. They create an enveloping sound which is backed up by the powerful subwoofer which conveys a sense of realism from the played sounds. The chair has a lot of features such as wireless connectivity and ability to connect to other chairs. Overall, this gaming chair with speakers is a good investment for professional gamers who want a comfortable listening experience while playing games. The X Rocker Pro 51259 H3 is one of the best gaming chair with speakers with some impressive features and delivers a high level of comfort. This chair has a 4.1 audio speaker system incorporated that creates a truly immersive experience for the user. It has two tweeters discreetly positioned in the headrest facing outwards, another set of two tweeters in the lower part of the chair with a similar configuration, and a subwoofer and sound hole in the lower back of the chair, facing backward. The chair has a vinyl fabric cover which is easily cleaned and can withstand continuous usage. Its ergonomic design ensures that it can be used for long periods of time without causing any strain to the user. The chair rocks back and forth, releasing some strain caused by long sitting periods. The armrests also provide an additional level of comfort. The chair has a built-in radio receiver for wireless transmission, so, using the provided radio transmitter, you can connect to any device without any inconvenience caused by tethering. Overall, it’s one of the best gaming chair with speakers that provides great value for money and we highly recommend them. The X Rocker Pro 51259 H3 has a very well-designed and well-implemented sound system, using a 4.1 speaker configuration. The design of the speaker configuration creates an immersive experience which is excellent for both video games and music. There are two tweeters installed into the headrest, pointing outwards and creating the auditory illusion that the sound is coming from the room around you. Two more tweeters are installed in the lower part of the chair, providing a sound source from below for a 3D sound experience. The subwoofer at the back sends through deep and powerful vibrations throughout the chair that correspond to the bass response of the audio. This provides a 3D immersive experience while gaming. The integrated radio receiver works very well, ensuring that the audio transmission is of high quality and that there are no losses, lags or delays. The speakers have a good volume output and render audio in high definition. The panel allows for individual control of bass and treble which can help the user achieve a balanced sound. This multimedia chair has a very high quality, well-thought design. 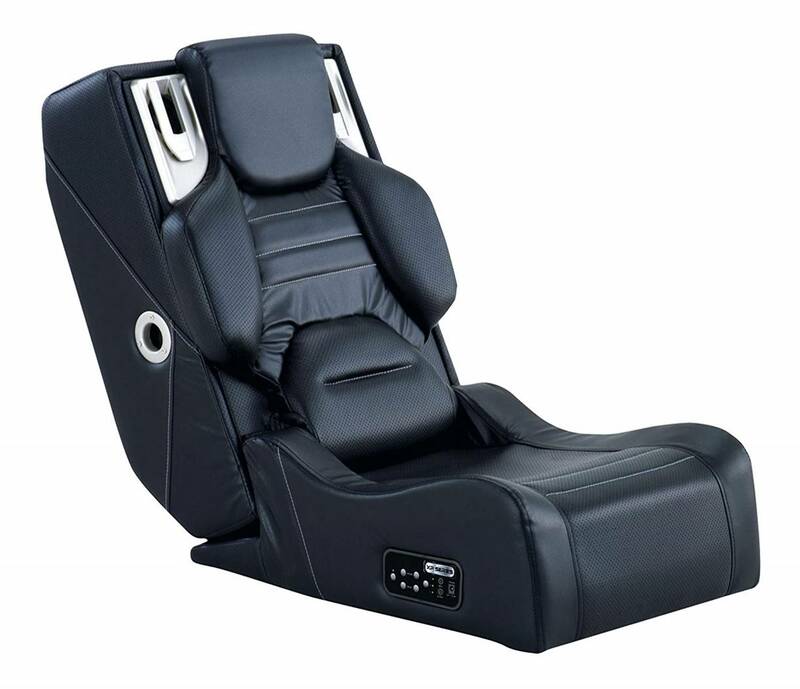 From the implementation of the audio system, to the sturdiness and comfort of the chair itself, the X Rocker Pro 51259 H3 provides a good and immersive experience, not only suitable for video games, but also for movies, music and relaxing. The Audio Force Modulation technology developed by Ace Bayou ensures a sense of realism by sending powerful low frequency vibrations throughout the chair to create a sense of realness. The AFM technology is further enhanced by the vibration motors, which are implemented to synchronize with the bass tones and create a more convincing movement sensation within the chair. The chair can be connected with multiple others to create a better experience for multiplayer games. The vinyl fabric out of which the chair is upholstered is very durable and is easily cleaned. The chair is compatible with almost all video game consoles and media player devices. Note that all these devices need to have RNC connectors to use either the chair directly or the provided transmitter. The Verdict? The X Rocker Pro 51259 H3 gaming chair with speakers is ideal for hard-core gamers that value sound quality and comfort. The X Rocker Pro 51259 H3 delivers an excellent audio experience that can be used by gamers and casual users alike. It’s multi-purpose, meaning it can be used for movies, music and relaxing as well. The well implemented audio system provides an immersive experience, and the added vibration motors that mimic the bass response offers a feeling that is more enveloping than going to the cinema. The chair is comfortable and can be used for long periods of time without causing any strain. The vinyl cover can be easily cleaned and offers a high level of comfort. The X Rocker 51259 is also compatible with a wide variety of music devices including PS3, Wii U, Xbox 360, and Nintendo 3DS and mp3 players. Overall, the X Rocker Pro 51259 H3 is one of the best gaming chairs with speakers that is great for playing video games and listening to music, and we highly recommend them. The Ace Bayou X Rocker 5127401 gaming chair with speakers offers the user a comfortable and immersive gaming experience. This gaming chair provides high quality sound performance and is compatible with Xbox, Playstation, Gameboy, Nintendo Wii and DVD players. The chair is made in the USA and features a well-implemented audio system and an ergonomic design. It is compatible with most gaming devices, as well as MP3 and DVD players. The audio system features 2 tweeters, discreetly built into the headrest and a subwoofer built in the lower back of the chair. The chair has another convenient feature, using a built-in wireless transmission receiver that allows for cordless use, giving the user the option of locating the chair in any location. The X Rocker is foldable and can easily be put away and stores when not in use. It is built upon a pedestal that swivels and tilts to create a comfortable experience that removes any pressure that can build up in the spine and back. The chair’s side panel offer control over the volume and bass. It’s a gaming chair with speakers that delivers great value for money, so don’t forget to check them out! The sound of the Ace Bayou X Rocker 5127401 is high quality and designed in such a way to create a sense of immersion while gaming. Ideal for video gaming, this chair has 2 tweeters situated in the headrest that produce sound close to the listener’s ears, mimicking the feeling of hearing sounds from an outside, real-world source. The subwoofer uses low-frequency energy to create vibrations in the chair that further enhance the feeling of envelopment, giving the user a physical response to an event happening on-screen. The placement of the tweeters and subwoofer in the top of the headrest and in the bottom of the chair, respectively recreates a natural vertical sound image created by the perception of audio frequencies. The panel on the right hand side of the chair allows for control of the volume and bass, giving the user the ability of adjusting the ration between treble and bass as desired. The placement of the tweeters, with the drivers firing at a 90-degree angle compared to the ear adds to the feeling envelopment as sound is not played directly into the eardrum for a hyper-realistic sound. It also helps reduce listening fatigue and enable longer listening sessions. The ergonomic design of the chair works great and enables the users to have long gaming sessions without feeling much strain. The swivelling pedestal allows slight position changes to release tension from the muscles. The armrests can be lifted up offering that extra degree of customizability. The speaker system is discreetly implemented and barely noticeable, yet delivers good sound projection. The chair also features a built-in wireless system which removes any inconvenience caused by tethering cords. The heavy duty upholstery vinyl cover provides a comfortable surface and is also easily cleanable. The chair is easily foldable and the pedestal can be removed, which allows for convenient storage when it’s not being used. The chair can be connected to other gaming chairs, creating an excellent multiplayer gaming experience. The Verdict? The Ace Bayou X Rocker 5127401 is a great gaming chair with speakers that provides a good experience for listening to music and watching movies. It has an integrated 2.1 sound system with 2 built-in speakers and subwoofer. The ergonomic design enables the user to have lost lasting gaming sessions without creating much discomfort. This is due to the swivelling pedestal which can be used to regularly relieve built up tension in the back. The chair also has a wireless audio receiver built in and is therefore not held in one place. The control panel offers the ability of adjusting the bass level to the overall volume, creating a balance that is adequate for the medium that it is used for. Overall, this gaming chair performs very well and delivers on its promise of enhancing the gaming experience by providing immersive audio and high levels of comfort. The good design and implementation make this chair a viable option for listening to music and watching films too. It can be easily stored and it can be used for very long periods of time without having any technical or wearing out issues. On the whole, it’s one of the best gaming chair with speakers we have tried out and highly recommend them for its comfort and quality audio speakers. 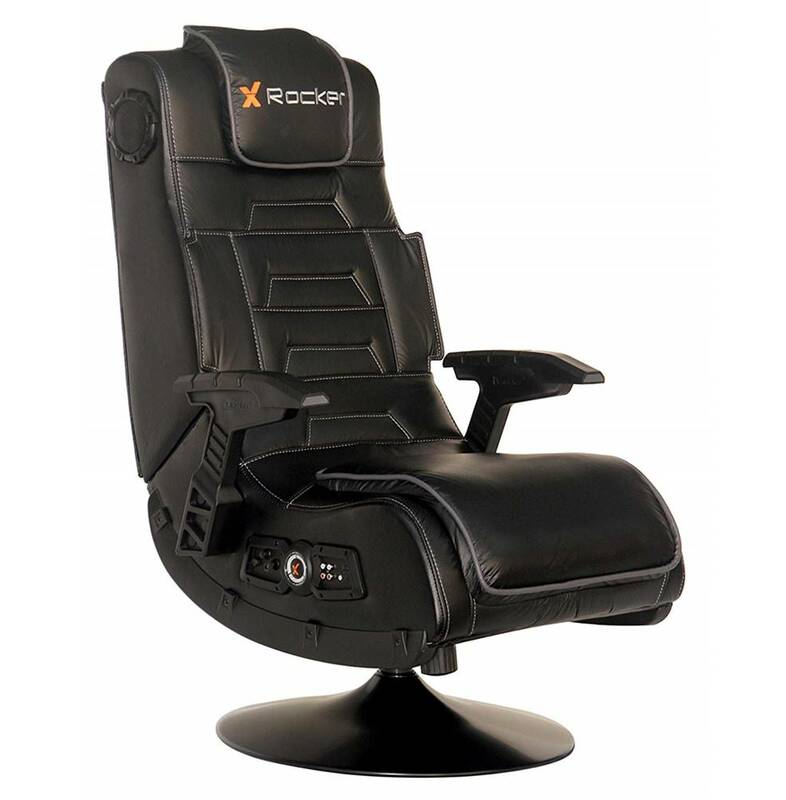 The X Rocker Commander is a sturdy, well-built gaming chair with speakers that is great for playing video games and listening to music. The chair has been designed with the idea of creating an immersive experience, which it does very well with the use of the 2.1 audio system. It is very comfortable offers good support for long term usage that can fit any kind of body type. It is covered with a durable and stylish polyester seating that keeps cool during long hours of use, which is perfect for summer usage. The chair is placed on a pedestal that offers an elevated seating position. The pedestal allows the user to tilt and swivel, which greatly increases the comfort level as it allow for good weight distribution and removes any consistent strains from happening. The chair has a control panel on the right side of the seating cushion which allows for volume and bass controls, as well as having RCA and TRRS inputs. It also features a couple of RCA outputs which means that it can be connected to another chair or another audio system. Overall, the X Rocker Commander is one of the best gaming chair with speakers with an ergonomic design for a comfortable gaming experience. The X Rocker Commander provides high quality sound through its well-design and well-implemented 2.1 audio system. The chair features 2 tweeters that are placed near the headrest and provide high quality stereo audio. It also has a subwoofer in the lower part of the chair that is using Audio Force Modulation Technology. The subwoofer delivers deep bass frequencies and sends powerful low-end vibrations into the chair that replicate the actions happening on the screen. The tweeters, being in close proximity to the ears of the user, provide an immersive experience by giving the impression that the sound sources of the events happening on screen are coming from around the user. They have a relatively high output volume that can be controlled with the volume knob situated on the right hand side of the seating cushion. The chair gives you the ability to control the volume of the tweeters and of the subwoofer individually, so you can adjust the levels in order to get the best experience. The X Rocker Commander can receive audio from any type of output through its RCA and TRRS connectors. 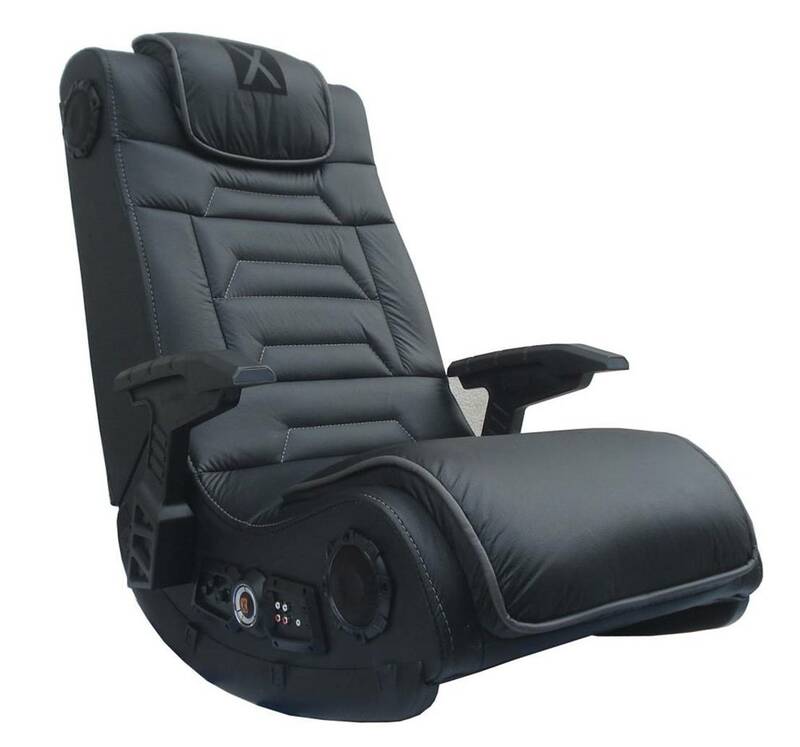 The X Rocker Commander gaming chair is sturdy and comfortable, being able to offer a good experience for any kind of body type. 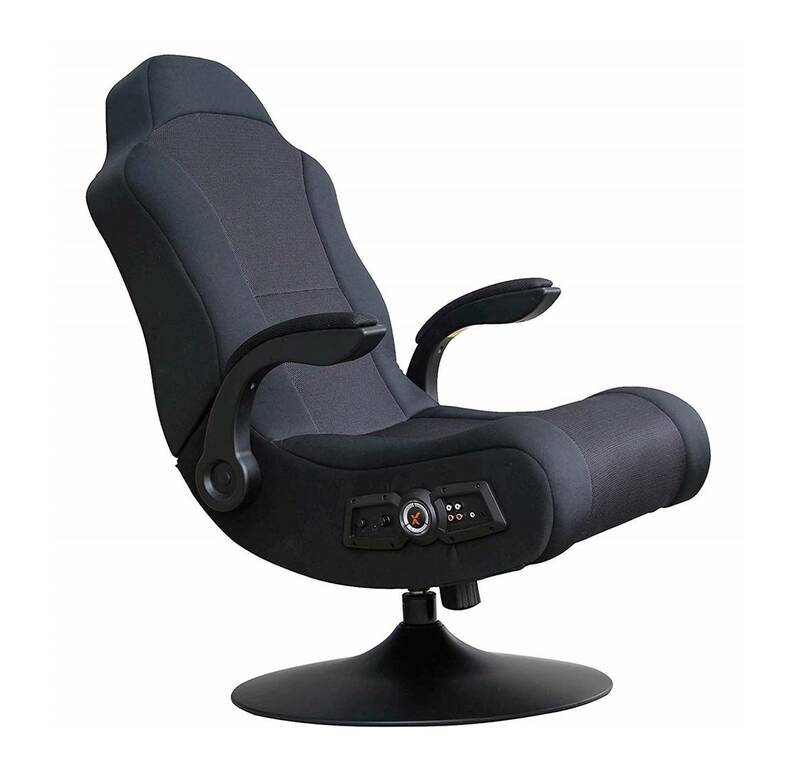 The gaming chair has an ergonomic elevated seating position with arms and pedestal with tilt and swivel capabilities. It also features a durable and attractive polyester seating surface which keeps cool during long hours of use. The swivelling pedestal offers a great deal of adjustment abilities and it helps the user in moving around without having to interrupt their gaming session. The chair provides high quality audio full-range sound performance with great speaker positioning for detailed separation. The speakers are subtly implemented and do not compromise the look of the chair. The panel on the right features all the necessary controls. The chair can be connected through other gaming chairs or audio systems through it RCA outputs, which allows for an inclusive multiplayer experience. The Verdict? 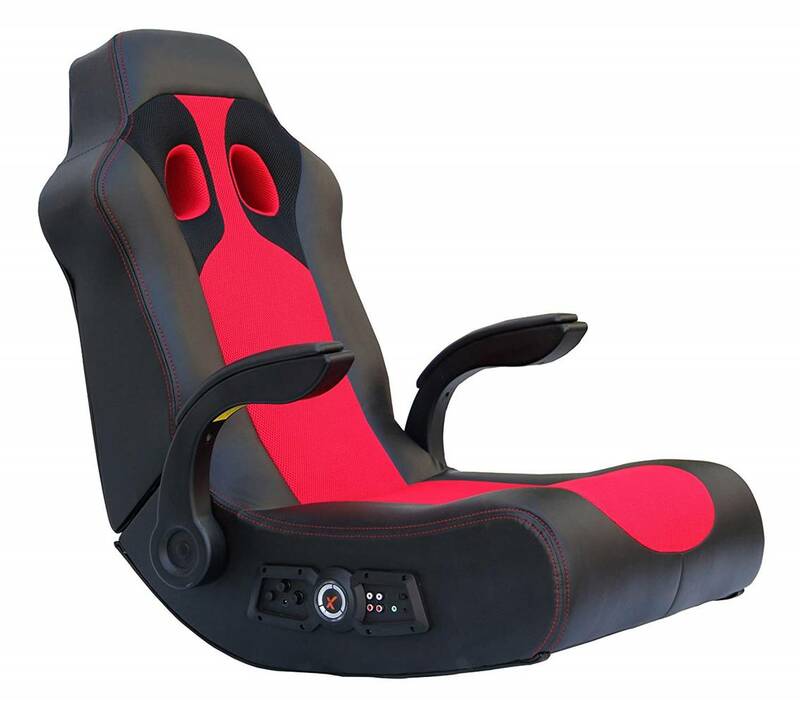 The X Rocker Commander gaming chair with speakers has been designed to provide a better gaming experience. The chair can be used for versatile purposes including playing video games, listening to music, watching TV and relaxation. It comes equipped with two speakers for a total sound immersion experience. The 2.1 audio system and the Audio Force Modulation technology offers a sound experience that captures all the details in the video game. The chair can be connected to any type of audio source and it can also re-send the audio further with its RCA connecters, creating the opportunity of a multiplayer experience; it will also play music from any source with headset or RCA outputs. The sturdy design of the chair ensures that it will last a long period of time and that it will help prevent any long-term back related issues. Overall, the X Rocker Commander is one of the best gaming chair with speakers that delivers solid sound quality and comes highly recommended. The Cohesion XP is one of the best gaming chair with speakers that enhances gaming experience with quality audio and a comfortable design. The chair has an ergonomic design that reduces strain and fatigue on the body for long gaming sessions. The Cohesion XP has been designed to be as comfortable as possible and reduce any strains and aches created by sitting for long periods of time. The built in 2.1 sound system is integrated very discreetly and plays the stereo sound of the game, creating a 3D sound effect. The chair is also lightweight and can be moved around the room and the house easily making it useable in different scenarios, not only gaming. The connectivity is wired through a 3.5 mm TRRS jack connector. The chair also has a volume control on the right hand side of the seating cushion. Overall, the Cohesion XP is a minimalist gaming chair with speakers that delivers good value for money. The Cohesion XP has a discreetly integrated 2.1 audio system that has been designed in such a way to create a sense of envelopment for the user. It has 2 tweeters that are installed in the headrest in close proximity to the ear. The tweeters have a good volume output that can be adjusted with the volume knob controller on the right hand side. The headrest speakers create a sense of envelopment as they are fairly wide apart considering the positioning from the ears. The drivers fire sound slightly upwards at an angle and are fairly close to the ears. Compared to headphones, these create a much wider image and sense of envelopment. The subwoofer is placed in the lower part of the chair and produces low frequency sounds the vibrate the chair to provide a truly immersive experience. The subwoofer replicates the actions happening on the screen to give a real sense of ‘being there’. The placement of the tweeters and subwoofer is well designed, with the high frequency producing speakers on the top and the low frequency producing speaker at the bottom to recreate a natural vertical sound image, where higher sounds are perceived higher on a vertical axis and lower sounds are perceived lower on a vertical axis. This gaming chair can be used for multiple purposes and can be easily moved around the house and deliver a comfortable experience anywhere. It is also foldable, which means it can be stored easily in smaller spaces and be carried around to other locations. The control panel on the left hand side provides a volume knob that allows you to control the sound system’s output, a wired jack TRRS input and also features an output that can connect to other similar chairs for a multiplayer experience or another sound system. The fact that this chair uses a standard stereo jack as a main connector means that it can connect to any type of device, not necessarily a gaming console, making it versatile enough to listen to music or watch films while reaping the benefits of the well-implemented sound system. This way, users can immerse themselves not only in video games, but also in music and in films. The Verdict? The Cohesion XP gaming chair with speakers offers high levels of comfort and convenience and can be used for gaming, watching films or listening to music. It is suitable for anyone and provides a good experience and can be used for long periods of time. Due to its ergonomic design, it minimizes any pains or strains caused by long periods of sitting. The 2.1 integrated sound system is very well designed and well-implemented, offering 3D stereo sound output while gaming or playing video games. The subwoofer creates a physical response to the events and actions happening on screen that give the feeling of being transported in the world of the video game or movie that you are playing. Its lightweight design makes it very convenient to be moved around and its foldability makes it easy to store and transport. It is suitable for more than just video games and can be used in different contexts such as relaxing or using it a table chair when needed for long periods of time. Overall, the Cohesion XP is one of the best gaming chair with speakers that is lightweight, comfortable and delivers real quality sound performance. The Ace Bayou V Rocker 5130301 SE is well designed and high quality gaming chair with speakers that provides an interactive audio experience. It has a 2.1 sound system implemented in it that creates an enhanced experience for playing video games by immersing the user into the world of the video game. The right hand side panel located on the seating cushion provides control over the volume and bass, as well as the input and output slots to connect the chair to a sound source. The ergonomic design of the chair ensures that it can be used for long periods of time without having the users suffer from strain, pain or aches caused by long sitting periods. The build of the chair is solid, enabling any kind of body type to use it confidently. The chair is also designed to last for a long time, featuring a heavy duty vinyl and mesh cover that is easy to clean and maintain. The sound system also has the option of wireless connectivity which allows you to stream music directly from your smartphone device; it also has a side control panel with volume, bass control and input/output jacks. Overall, it’s a gaming chair with speakers that provides a clean setup and comfortable gaming experience. The sound provided by the V Rocker SE is of high quality and delivers an immersive gaming experience. The output of the sound system is relatively loud and it can be controlled with the 2 knobs for overall volume and bass level. These 2 controls can give the user the ability to adjust the balance between the high and low frequencies to match the type of media that they are consuming. The tweeters are placed inside the headrest at a fairly close distance to the ears. They are pointing forwards and this type of design envelops the user into the gaming world as the sounds seem to be coming from around the room, rather than in front of the user as with normal speakers. The subwoofer produces low frequency sounds that create a physical sensation in the chair to give the user the impression of the reality. The bass mimics the actions happening on the screen. The placement of the speakers, with the tweeters on top and the subwoofer on bottom are in accordance to the natural perception of sound in the real world, where high frequency sounds are perceived higher on the vertical axis and low frequency sounds are perceived lower in the vertical axis. The Rocker 5130301 gaming chair with speakers is well designed and provides an integrated audio system. The gaming chair has two forward facing speakers with a powerful subwoofer that provide full-range audio with deep bass. The audio system also has the option of a wireless connection, which make the chair this more versatile. Not being tethered by cords, this removes any potential hazards of tripping and falling, and it also means that the chair can be moved around the room without having to remove the whole setup. This gaming chair supports wireless audio transmission and headphone jack inputs. The ergonomic design of the chair ensures that anyone can use it for long periods of time without having to suffer from any strain caused by sitting. The lack of armrests means that any users can sit in any position they want in the chair without being constrained. The Verdict? The Ace Bayou V Rocker 5130301 SE is a high quality gaming chair with speakers with a tonne of versatile features. Because of its well implemented sound system and ergonomic design, this chair does not have to be used only for video games, but it can also be used for watching films, listening to music, or simply relaxing. The same comfort and immersive experiences are going to enhance those activities in a similar manner. The gaming chair comes with two forward facing speakers and a subwoofer for lower-end sound reproduction, and supports wireless audio transmission and a headphone jack. It also has side controls for volume, bass and input/output jacks. The gaming chair has an ergonomic design with full back support for a comfortable gaming experience. Overall, the Ace Bayou V Rocker 5130301 SE is one of the best gaming chair with speakers that has great sound quality and an ergonomic design for lasting comfort. The X-PRO 300 Pedestal Video Rocker is a solid gaming chair with speakers that provides an immersive audio listening experience. It features a 2.1 audio system with two tweeters placed in the headrest and a powerful subwoofer in the lower part of the chair. This audio system provides a convincing immersive experience that makes playing video games that much more exciting. With the use of the Audio Force Modulation technology developed by Ace Bayou, the chair creates a physical response in accordance to the events that happen in-game. Another feature of the X-PRO 300 is its wireless Bluetooth connectivity that allows the chair to connect to any Bluetooth device without having to be tethered by cords. The X-PRO 300 features an ergonomic design that allows users to sit for long periods of time without having any aches or pains. It enables users to have extended gaming sessions and the pedestal that tilts and swivels allows user to distribute their weight in the chair accordingly and remove any prolonged strain without having to interrupt their game. The chair also features armrests which help with arm and shoulder support and keep the user in a straight position. The control panel with all the knobs and input/output slots is located on the right hand side of the seating cushion. On the whole, the X-PRO 300 is a really good gaming chair with speakers and is definitely worth a closer look. This X-PRO 300 gaming chair delivers on the promise of immersive audio with its well-implemented sound system that feature two tweeters and one subwoofer. The tweeters are located in the headrest at a fairly small distance from the users’ ears and are not firing sound straight into the listener’s eardrums. This way, it gives the user the impression that the sound, while crisp and clear, comes from the room that he is placed in. This setup offers a great deal of spaciousness and keeps listening fatigue to a minimum. The subwoofer produces low frequency sounds in accordance to the events happening on screen. These low frequency sounds are felt in the chair as real physical sensations, creating the illusion that the actions from the game are real and have a direct impact on the user. The X-PRO 300 offers control over the bass and treble individually, so the users can set their balance between the high and low frequencies as they wish. The wireless connectivity using Bluetooth technology ensures an audio transmission of high quality with minimum losses and latency. 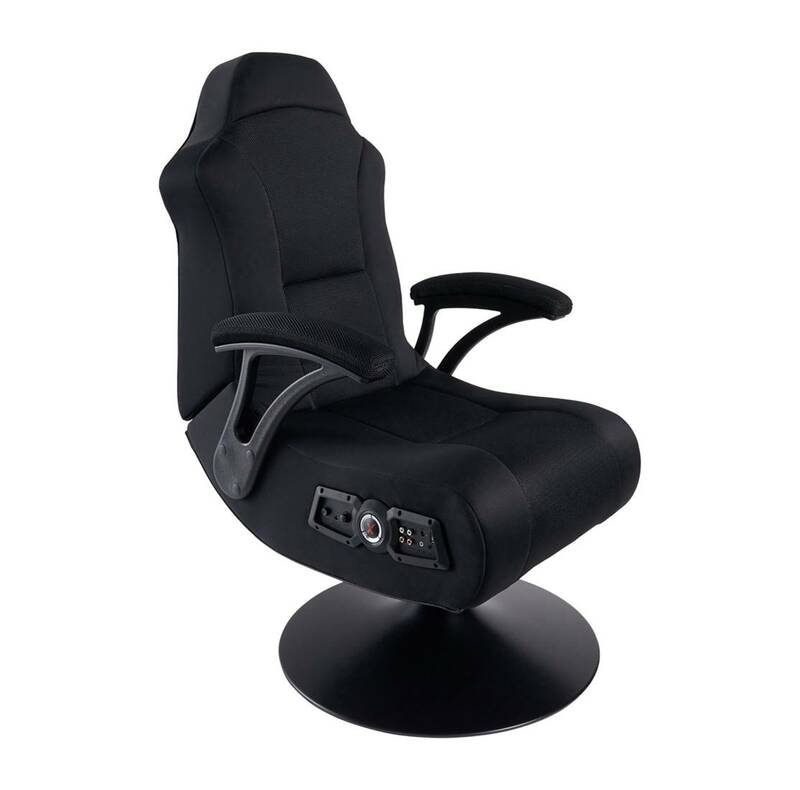 The X-PRO 300 gaming chair has a lot of features that create a comfortable and convenient experience. Its ergonomic design allows for long gaming sessions. The swivelling pedestal is great for letting users adjust comfortable in their chair and move around regularly to avoid strains across the back. The armrests provide additional support for the arms and shoulders while keeping the users in a straight posture. The audio system is discreetly implemented and poses no inconvenience. The wireless connectivity allows for cordless usage, thus removing any issues caused by tethering cables such as being able to place the chair anywhere in the room and minimizing the risk of accidents caused by hazards such as loose cables. The panel situated on the right of the chair offers all the control necessary, from powering on to volume controls and inputs/outputs. The chair can be connected to other gaming chairs which are great for multiplayer gaming sessions. The Verdict? The X-PRO 300 gaming chair with speakers has a solid build and well-designed features. It is ideal for gaming usage, but it can also be used for consuming other types of media, such as watching films, listening to music, or simply relaxing. The well-integrated 2.1 audio system can be used to enhance the experience of films and music while maintaining consistent audio quality. The chair can fit any kind of body type and can be used for long periods of time. It is suitable for people of all ages and is a great addition to any entertainment room, office or living space. The Bluetooth connectivity is a nice added touch and you can stream music to your chair directly from your smartphone device. Overall, the X-PRO 300 is one of the best gaming chair with speakers that provides a great combination of sound quality, comfort and versatility. The X Rocker 5172801 Ace Bayou gaming chair with speakers is built for professional gamers who want a great audio experience. It features a 2.1 audio system that is built-in inside the chair and delivers an immersive experience with the positioning of its speakers. The transmission can be both wired and wireless, through RCA/TRRS cables if wired and through Bluetooth fi wireless. The chair has all its controls on a panel situated on the right hand side of the seating cushion, featuring the on/off button, bass control, volume control and the wired input/output connections. 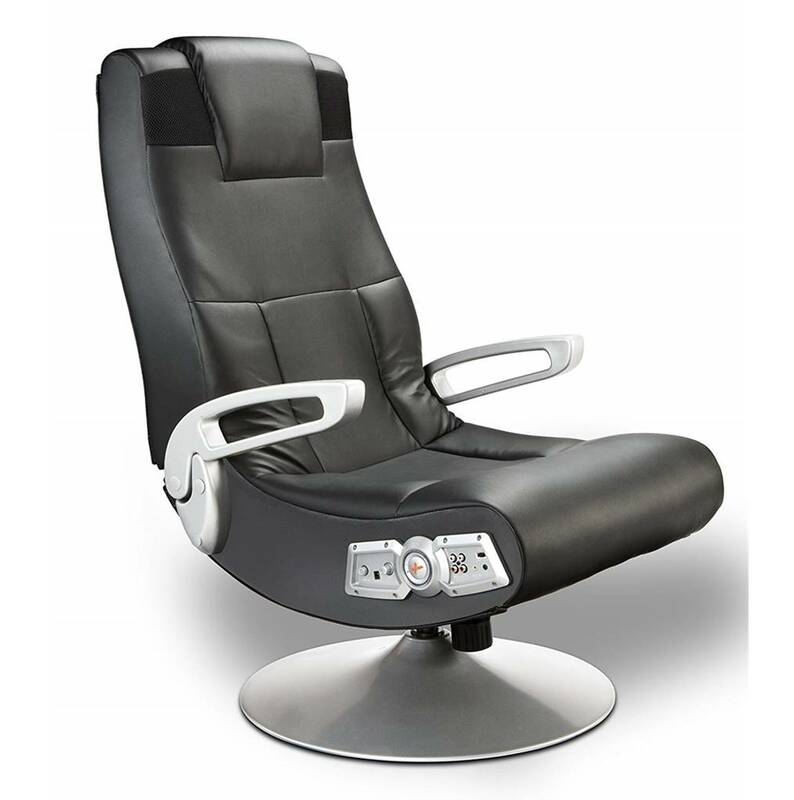 The X Rocker Vibe Sound Chair has a faux leather upholstery that gives it a stylish and modern look, while making it resilient throughout time and easy to clean. The chair has an ergonomic design that allows the user to have prolonged gaming sessions without creating any discomfort or pain. It provides good support throughout the body. The armrests are easily flipped up depending on the circumstances and the preference of the users. The chair can also be folded, its backrest going over the seating cushion, to be easily stored and moved around. It’s one of the best gaming chair with speakers with an ergonomic design and full 2.1 stereo output. The well-implemented audio system features 2 tweeters and one subwoofer placed in strategic locations in the chair. The 2 tweeters are placed in the headrest at a fairly close distance to the listener’s ears, providing full surround sound experience. As the speakers are not firing the sound directly into the eardrums of the user, the sound fills up the room and also reduces listening fatigue, allowing for long gaming sessions. The subwoofer produces powerful, low-frequency vibrations that replicated actions from the screen a cause a physical response in the chair. This low frequency vibration gives the user the feeling that actions happening on the screen are real, and reproduce deep in-game sound effects with precision. The placement of the speakers creates an accurate representation of a natural listening environment. We enjoyed playing games including Fallout and Fornite while sitting on the X Rocker gaming chair with detailed sound effects and clear dialogues. The ergonomic design of the chair helps to reduce fatigue after prolonged periods of gaming. The build of the chair is solid, being resilient and able to last a very long time. The faux leather upholstery gives it a modern and sleek look while adding to comfort and helping the user to keep cool, while also being easy to clean in case of spills. The chair is foldable, which means that it can be easily stored in small places and transported without taking up too much space. The armrests can also be flipped up depending on the user preferences. The chair has the option to connect to any devices using Bluetooth technology, which provides clear audio without any transmission issues or latency, enabling the user to fully immerse themselves into the video game. The chair can also be connected with wires through its RCA and TRRS ports in the control panel. The output RCA ports mean that multiple gaming chairs can be connected together for a multiplayer gaming experience. The Verdict? The X Rocker 5172801 is one of the best gaming chair with speakers with a great combination of sound quality and comfort. The chair comes with a variety of useful features which makes it great for reading, playing video games, watching TV or relaxing. The chair has a built-in 2.1 audio system that helps deliver an immersive experience through the placement of speakers with Ace Bayou’s Audio Force Modulation technology. The sound performance on the X Rocker chair is very good, with crisp highs, nice midranges and good bass response with its dedicated subwoofer – this makes playing games on the chair a very enjoyable experience. The chair will also play music from any source with headset or RCA outputs. The chair has an ergonomic seating position and comes with separate volume and bass controls for easy adjustment. It is also easily foldable for portability and storage. Overall, the X Rocker 5172801 is one of the best gaming chair with speakers that provides superb sound quality and a comfortable gaming experience, and we highly recommend them. The Proxelle Audio gaming chair with speakers is designed to bring a higher level of comfort and enhance the gaming experience through the use of immersive audio. It comes with 2 integrated speakers that are placed in the headrest of 3 watts each. Its ergonomic design features wider back and seat cushion with added lumbar support to enable long gaming sessions without causing any pain and strain. The chair is equipped with multiple pockets for your devices so everything can easily be kept in one place. It also has a built-in control panel for volume and input/output options. The chair can be easily stored as it can be folded where the seat cushion and backrest are joined together, making it compact and easy to carry to hidden in small places. The Proxelle Audio chair can be used with most gaming consoles such as the PlayStation and Xbox series, and it can also be connected to your personal computer and mobile phone. Its usage is not only restricted to games. It can also be used for other types of digital media such as watching movies and listening to music, having the same immersive experience. If you are looking for a gaming chair with speakers for an immersive audio experience, the Proxelle Audio gaming chair is a great choice. The Proxelle Audio gaming chair has a well-implemented and well-designed stereo audio system speaker. There are two small speakers of 3 watts each that are discreetly installed in the headrest. Even though they have a small amount of power, they can render very loud music, and their proximity to the ears often means that they are not going to be used at full volume most of the time. They provide crisp and clear high quality sound that does justice to the games being played. Their positioning is the design element that provides the immersive experience. Being placed in the headrest, in close proximity to the ears, the speakers offer a sense of immersion as the sound appears to come from the surrounding area at a very wide angle, compared to headphones that create a very close image and to normal speakers that have a narrow frontal image. The speakers also do not cause much listening fatigue as they do not shoot directly into the eardrums, enabling long listening sessions. This gaming chair with speakers has a very comfortable and well-thought design that provides great support for professional gamers. It is well-built, being able to last for long periods of time. The gaming chair comes with mesh pockets on the back and side which give you the space to place your phone and other devices. It also comes with a control panel which allow you to adjust the volume easily. The wide back and wide seat cushion allow the user to sit however they need to and do not limit them to a single position. The gaming chair has a foldable design for easy storage and transportation even in compact or small spaces. The chair is also pretty lightweight considering its size and stability, so it can be easily moved around the house for whatever purposes you need it to. The lumbar support that it offers is required for this type of experience, so that when used long-term, it does not create any chronic back pain issues that are often encountered with normal chairs. The speakers are well-implemented in the headrest of the chair and are barely noticeable, and they have a steel mesh cover over them which minimizes exposure to the diaphragm and drivers. The Verdict? The Proxelle Audio gaming chair with speakers has a very good design and is suitable for anybody that needs a chair that provides good support and superb audio to enhance their gaming experience. It is lightweight, which means that it can be moved around the room easily to fit different purposes, and it is also foldable, which means that it can be easily stored and transported. It provides good support for any kind of body type and can be used for long periods of time without creating any strain, aches or pain. This gaming chair provides an immersive audio experience that can be used for gaming, watching films and listening to music. The chair itself is very comfortable to sit on for extended periods of time, and has a wider and thicker headrest and lumbar cushion with an ergonomic shape to minimize fatigue. Overall, the Proxelle Audio chair is one of the best gaming chair with speakers that we have come across and definitely recommend them. 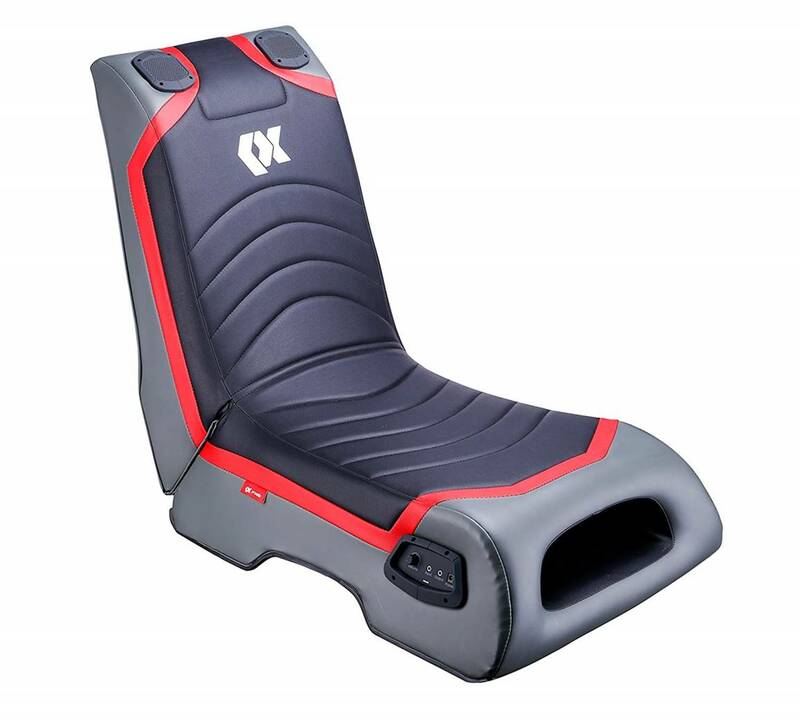 The Cohesion XP 11.2 is a very comfortable gaming chair with speakers and is made from high quality components. This gaming chair is styled exactly like the seat of a high-end sports car and is covered with black faux leather for a modern, sleek look and added comfort. It has an integrated 2.1 audio system that is very well implemented and can be connected wirelessly, adding another layer of convenience pf versatility. The volume control can be found on the right hand side panel alongside its headphone jack, power button and input/output slots. The ergonomically design of the chair ensures that users have the most comfortable gaming experience possible. The chair can be used for long periods of time without having any issues or fatigue. The chair can be used for gaming and other entertainment and leisure purposes as well including watching movies. 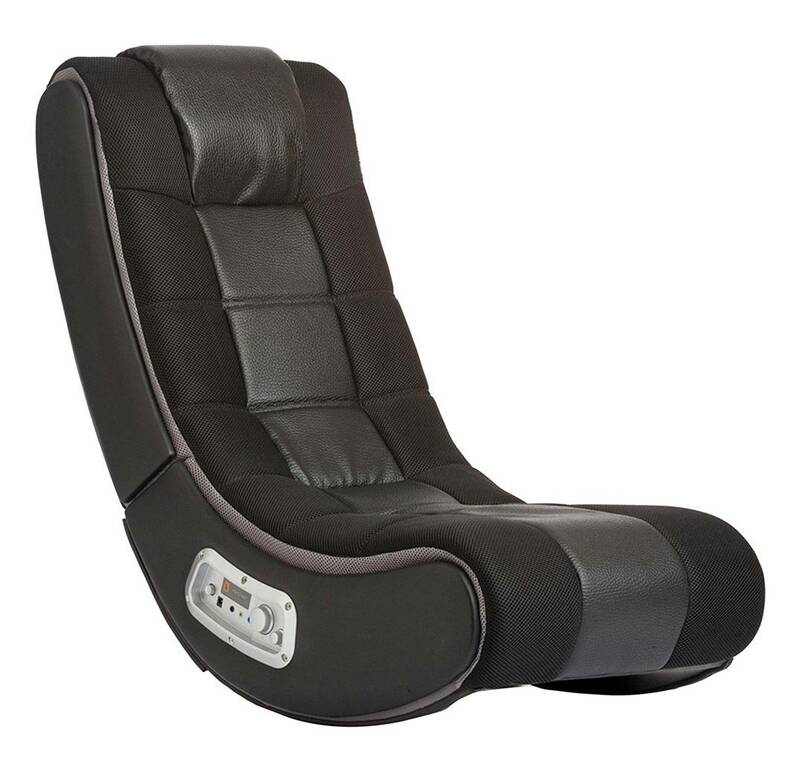 One distinctive feature of this gaming chair is that it can be folded; the backseat comes over the seating cushion to convert into an ottoman that can be easily used in any kind of room without occupying much space. Overall, the Cohesion XP is a comfortable gaming chair with speakers with lush padding and decent sound quality. Sound-wise, the Cohesion XP provides a very high quality experience. The gaming chair has a 3-chanel audio feature that provides great sound with its fully integrated speakers and subwoofer. The placements of the tweeters in the headrest are one factor that contributes to the immersive experience that the chair provides. The speakers are situated closely to the ears of the listener and the distance between them offer a wide stereo image that gives the user the impression that the sound source is located inside the room in which they are playing. The subwoofer creates low frequency sounds that produce physical vibrations, following actions on screen. This feature gives the user the feeling that the events happening in the video game are real. The placement of the speakers, with the tweeters on top of the chair next to the ears and with the subwoofer lower, closer to the users’ core replicates accurately the height perception of sound in the natural world. Playing games with the Cohesion XP chair was a very enjoyable experience and you can hear the detailed in-game sound effects with great accuracy. The ergonomic design of the Cohesion XP provides a very comfortable experience that allows users to play games for long periods of time without feeling strains or pains that are usual with normal chars. With added lumbar, shoulder and head support, the chair moulds perfectly over a person’s back. The chair also features a wireless connectivity options, freeing the user from any tethering cords that are inconvenient and can also be a potential hazard. On the other hand, the sound quality transmitted through the wireless connectivity is not as good as through the wired connectivity. To conserve space, the chair folds into an ottoman that can be easily used in any kind of room without taking up much space. It can also be more easily stored and transported. The chair features a faux leather cover that gives it a stylish, modern look and added comfort. It can also be easily cleaned without the risk of any stains. The Verdict? The Cohesion XP gaming chair with speakers has good build quality and delivers on the promise of comfort and immersive audio. As the sound system is very well implemented and the design of the chair is ergonomic and comfortable, this gaming chair can be use not only for games, but also for watching movies, listening to music or just relaxing. This gaming chair comes with an FM wireless, 3-channel audio feature with dual speakers and a subwoofer for crisp dialogues and cleans bass response. The chair can also be easily stored and transported with its foldable feature, so it can be placed in any room and look inconspicuous. It offers very good back, shoulder and lumbar support so it can be used for long periods of time, enabling the user to have continuous gaming sessions or movie watching marathons. We also liked the fact that the chair has easy touch-control panels for volume and headphone jack inputs. Overall, the Cohesion XP is one of the best gaming chair with speakers designed for audiophile gamers and we highly recommend them.